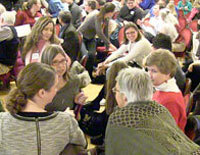 Instructing participants to seek out a next partner for discussion if resolution had been reached in the initial pair. In Mazur's own classes, students are told that the professor or a GSI will pair up with them if they are not speaking with a peer. Such reinforcement of the importance of every student's continued engagement sends a clear message that interactivity is a crucial component of the learning process in the class. This is an important message to send when using student-to-student learning of any sort, as we discuss in our recent blog post on teaching with student groups. Incorporating regular opportunities for students to meet new classmates, especially in large courses. This could be as simple as giving students time to introduce themselves to two new people at the beginning of each class meeting, a practice that can help move students to interact voluntarily with classmates beyond their normal social groups. Giving pairs a clear task, goal, and time frame. A structured activity and clear expectations about the outcome provide students a ready path to full engagement. Reminding students why you're using peer instruction in your course. When students understand the learning goals of a given activity, they will be more motivated to engage. Reinforcing the importance of the pair work by giving the class feedback on their engagement with a peer instruction activity. Whether it's simple affirmation that they all used the pair time well, or a reminder that they need to find partners more quickly, regular feedback on the process underscores its importance and fosters student engagement. For more on peer instruction, see the Turn to Your Neighbor blog or the Mazur group website. For more on "Inclusive Teaching," click the tag below.